The Purdy High School Spanish Club attended the Ozark Hispanic Studies League (OHSL) Regionals competition at Missouri State University on February 2, 2018. 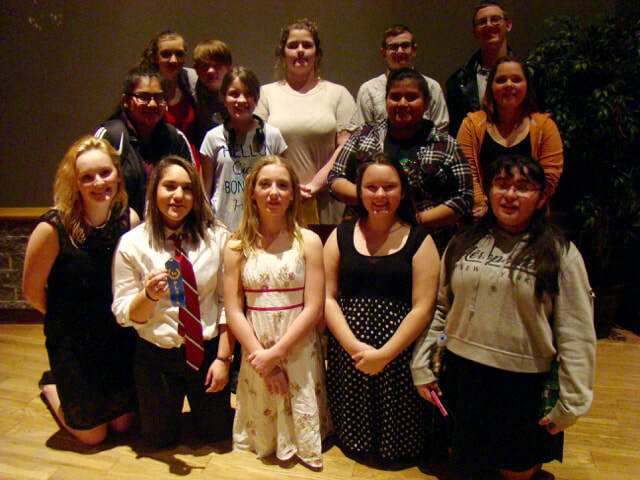 Purdy High School Spanish Club took third place in overall points. Amelia Hernandez and Stephanie Webb brought home first place in Beginners dance, and Chris and Emma Montoya received 4th place in Advanced dance. Stephanie Webb and Yeimy Pastor earned 3rd place in song, with their performance of “Bailar de Gorilla” by Melody. Spanish Club members danced to the song. Yeimy Pastor also received 3rd place in Hispanic vocabulary, with Jasmine Canales taking 4th place and Nancy Juarez receiving 5th place. Purdy High School Spanish Club members compete under the direction of Adviser Deborah Lay. The OHSL provides High Schools opportunities to compete in Spanish dance, poetry, vocabulary, culture bowl and singing. Purdy competitors are pictured above, from left to right. In the front row: Emma Montoya, Amelia Hernandez, Stephanie Webb, Emma Mitchell and Jazmin Rueda. Middle row: Nancy Juarez, Anna Hoffman, Yeimy Pastor and Torrie Graessle. Back row: Abby Chapman, Ryan Mitchell, Francis Mathews, Austin Gibson and Chris Montoya.